Kershaw Kaper/Guthook Combo. 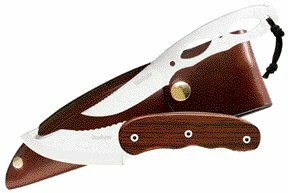 Includes 7 1/8" overall all AUS-8A stainless Kaper with a skeletonized handle and a 7 3/4" overall Majesty with AUS-8A stainless guthook blade and cocobolo wood handles. Harness leather belt sheath holds both. Designed by custom knifemaker Tom Veff.